I came to Montréal with a secondhand sheared mink duffle coat bought on eBay in 2000 for about $1200. It was probably made in the late '80s or early '90s at latest, judging from the boxy cut and very full sleeves that gather into a pleat at the wrist. I bought it in "as new" condition (except for someone's monogram in the lining), wore it only in the harshest Toronto weather and sent it to cold storage each spring, so it was in good shape– but, as you can see in the shot above, it had not really been à la mode since Celine Dion sang in French. A reno seemed a good idea, but I sought an expert opinion about whether that was worth undertaking. There are so many furriers here! My inquiries led me only to references far from where I live. 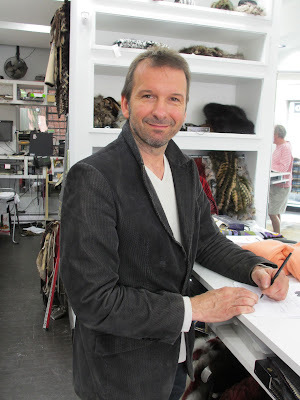 One day last spring, walking down a quiet block on Laurier St., I noticed the salon of Dominique Ouzilleau, a third-generation furrier. He was welcoming, patient with my shaky French, and best of all, seemed intrigued by the project. I took a long time checking out his designs (the only pieces he sells.) He's known for edgy, glam furs, and is especially proud that his team can produce colours seen nowhere else. My taste is far more conservative, but still, I was attracted by his flamboyance and innovation. Like the shy-guy accountant who meets Carson Kressley, I wanted that little zhuzh. I dropped off the coat; he called to say the skins were in great shape, and gave me a quote. Since Mr. O. and I were both dealing in our second languages, Le Duc accompanied me to ensure the words "sober", "strict" and "quiet" were transmitted loud and clear. Le Duc told him that the duffle was St. Laurent's preferred topper, day or night. 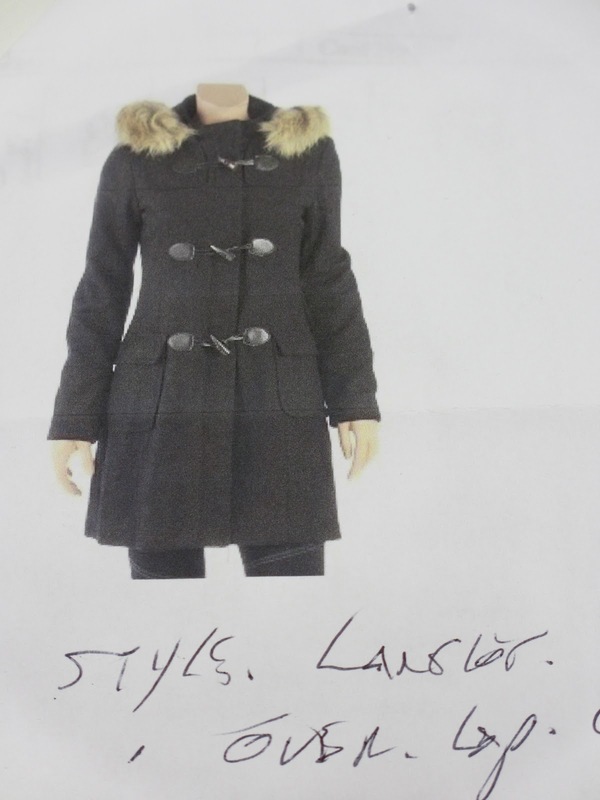 I bought a photo of a YSL woman's model, which he stuck to the work order. Feeling certain he understood my preferences, I paid a 30% deposit and–game on! I left the first fitting feeling flatter than a beaver's tail; the toile looked dowdy and uninspired, and nothing like the YSL coat. But Mr. Ozilleau took at least two dozen measurements and markings, so there seemed to be some point. Writing the cheque for the next 30% was not fun. I worried that I'd end up with a stiff, stodgy coat, maybe even worse than the original. This is the risk of custom work. A month later a friend who works on the street told me the shop had closed, but it turned out to be only for summer holidays. ("He's a furrier, it's August, relax", Le Duc said.) Still, I fretted. Mr. O. 's team had entirely recut the body and he was quietly confident at our early October meeting. Reunited with the supple glow of the newly-conditioned pelts, my mink mojo returned. I was prepared to replace the lining, thinking about a tartan or ruby satin, but Mr. O. said the existing chocolate-brown fabric was in perfect condition–it would be removed, cleaned and recut. How many couturiers would do that? 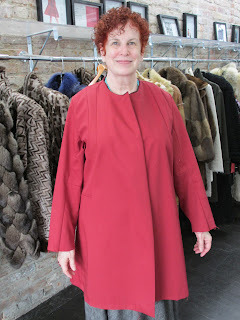 At this fitting, we discussed buttons and closure. I brought vintage buttons from Tender Buttons in New York; Mr. O. approved. (He advised against a toggle-and-loop fastening due to that closure's repetitive friction at the front placket.) This is the only fur coat I plan to own, and I agreed. He also suggested the more streamlined set-in pocket, instead of patch version on the YSL coat. Three weeks passed, but this time, calmly. The new coat has a much slimmer, semi-fitted body, higher armholes and sleeves that no longer resemble muffs. The hood is edged with a swath of long-haired mahogany mink, for that tweak I sought. The few incipient balding spots at the corners have vanished. The coat hangs beautifully and fits, well, like it was made for me. I was also impressed by his attentiveness and focus. He said he likes to meet clients more often than necessary to gain a clearer idea of their vision and preferences. Cost for the reno: $800, as quoted. Given the work and the cost of several friends' fur renos, this was a reasonable price. Two weeks later I brought in a friend who had a chic fur vest made from an old coat. The new label reads "Dominique Ouzilleau Haute Fourrure" and I'm a delighted client. Let it snow! What a great story with a happy ending. The coat is beautiful and, perhaps even more important, it looks great on you. I loved walking through this story with you...thank you for including the details and the process. The coat is gorgeous and looks amazing on you! Yes, it is lovely, very chic and sleek, and not too formal as mink can often be. What an incredible reno! I love it. I have a fur coat from my mother, that I've been thinking about "remodeling" for a few years. I don't have much motivation living in LA, but reading your story has again sparked my interest. Thanks, and your coat is marvelous! Just gorgeous. I do have a soft spot for furriers. My immigrant grandfather started a biz in his teens: it involved buying scraps from furriers and making collars and cuffs from them. I remember his workroom (no picture, alas) which was like something from another century (as indeed it was, I suppose). Oh it looks fantastic!! What a wonderful thing to find a true craftsman like this in these times. Your coat is so stunning and chic, yet it looks very comfortable. We rarely see furs here, except on Christmas Eve- such a waste. Our weather is very similar to Montreal's. I remember seeing many lovely furs on women and MEN in the 1980's when we frequently went to Montreal. Wonderful! That coat suits you to a T, and it's easy to imagine it worn over jeans as well as over dressier garb. And how wonderful to develop a relationship and watch the process -- both your friends and M. Ouzilleau will benefit, I suspect! (meanwhile, we're concerned with mink here as well, but the fur is alive and moving and recently evacuated--we hope!-- from our attic. Sorry for the multiple responses. Blogger kept insisting I'd got the words-letters wrong and making me do another test. Meanwhile, apparently, it was posting each comment! Wonderful! Both the process and the result. More photos! Also, he's cute. That's an extra benefit, no? WOW! That is gorgeous--and for the price (if you think of the outmoded fur as unwearable) of a nice-ish wool coat these days. Warm, velvety-slinky, appropriate for any cold-weather occasion. I love it. Coat looks lovely. I am very into renovating my good quality pieces this season. I have just had a 1984 leather jacket remodelled. You are inspiring me to look into altering a sheared beaver coat I have from that same era and of similar shape. It's the softest thing I've ever felt; I have thought that if I just keep it a little longer it will be considered vintage, but maybe I should go modern instead. Susan: Thank you, it should be cold enough soon to need it. Pam: I'm glad I documented the process and that you enjoyed it. lagatta: Yes; the duffle is an informal coat by definition, in any fabric. Kathy: Maybe a fur vest would be more wearable where you are? Hope you are cold-storing it. frugal: He is the third generation in his family. You should see his tools, beautiful etched-brass handles on the knives. Pseu: I'm a huge admirerer of these kinds of artisans and like to support them when I can. Kristien62: They are still worn here, even if only a generous trim on a down parka. 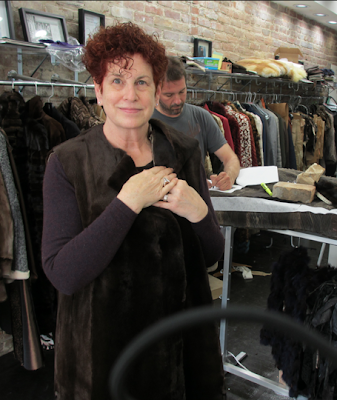 Like Moscow, fur makes sense here, and it is an historic, respected part of the economy. C.: Great way of looking at the reno cost! Mr O says a hardy fur like mink or beaver should last 40 yrs with proper care. Chicatanyage: Oh, great. Would you please show us? materfamilias: I spent a lot of time on a mink ranch growing up. Not cuddly cute animals. Even worse in your attic. MJ: Your comment made me realize there is kind of a "nowhere zone" between vintage and current that is just plain out of date. A reno while the pelts are in good shape is worth investigating. This was a fabulous story -- scrolling down was like reading a nail-biter novel -- will the coat cut be fixed?, would the zhuzh be there?, how would be it be made sleek not dowdy? The result was stunning -- the perfect, happiest denouement! Congratulations on a very smart reno -- it's gorgeous, unique, and extremely couture. Wonderful! The coat looks fabulous. I know fur is un-PC, but I admit I love it, and I would have a fur if I didn't live in Houston! I'm still mildly annoyed at my dear late mother, who had a mink cape-back jacket she bought for herself in the late 1940s when she was a stylish single gal, and then she GAVE IT TO THE GOODWILL without asking me if I wanted it ! What were you thinking, ma! That coat is gorgeous and worth every penny, it looks fantastic. Gorgeous results- you look amazing! V.O. : For a few weeks I thought it would be a horror story! Jill Ann: Oh no! Who knows what she was thinking but let's hope someone really appreciates it. re the "PC" issue: I've thought long and hard about it. I use animal products that involve the loss of their life, with gratitude. I eat meat, wear leather shoes. I live in a place where fur provides a real, useful benefit (down performs very differently- also, the ducks or geese are killed for it.) So, where I am now is that I will not buy furs of steel-trapped animals. As I've said before, I spent a great deal of time while growing up on a mink ranch. I know what the animals are like and how they are killed. coffeeaddict: Not dramatic, but eloquent. I feel that way too and you have expressed it beautifully. linda: Now we just have to get the temps to drop! I'd love to hear your stories of a mink ranch! And are those rectangles the buttons? May we see another image doesn't have the coat obscured by your (lovely) arm? What fun! And just think how cathartic it'dve been if you'd blogged the disaster! I could never afford a fur, doubt I could wear one anyway, yet I thoroughly enjoyed this post! A lovely peek into a whole other world. Thanks! What a difference. It truly looks beautiful on you. 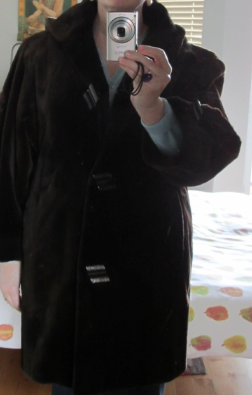 I got a mink last year and I have only been able to wear it twice as we have not had any really cold weather. Darn it, all the years I could've used it and now it is too warm! I'd love that orangey-red coat shown in the first picture. Wow. Wow, that's an amazing transformation and it looks beautiful on you!! He is obviously a very talented furrier. dana: A Danish couple, "Aunt" Ruth and "Uncle" Brager, close friends of the family owned the ranch, near our town. I stayed there when my parents traveled. Wendy: If you want a fur, consider vintage; a friend just bought a very pretty short mink jacket at a vintage store for $135. Debbi: It's only mid-Dec. so hope you get colder temps for the coat. Jacqui: His coats are absolutely jawdropping; mine is quiet compared to most of them, and they did light a little flame of "next" in me. How beautiful this is!!!! What a clever idea! You just put a bee in my bonnet, but there are no trustworthy furriers in Miami - that I know of..
Beautiful renovation and the price is great for complete renovation! On the basis of your story, I have spent the last 3 years pondering on whether or not to take the plunge with Mr O. I am delighted to say, that as of last Saturday, my 19 year-old mink has been transformed into a perfectly sleek, made to measure stunner. I am so happy with the result which by far exceeded my expectations. The work was considerably more expensive than yours (almost double) - prices have gone up over the past 3 years. Nevertheless, apart from suffering similar trepidations to you (and I mean big time doubts and fears! ), the result was magnificent and he only took 3 weeks for the whole process. The man is a master. Many thanks for the recommendation! Oh Fiona, I would love to see that. My e-mail addy is just under my photo; beg, beg. Sounds like you had more work done; my coat was already the same style, and just needed "de-'80s-ing" the sleeves and taking some bulk from the body. Did Mr. O. tell you he made this past winter's couture Dior collection? He is indeed a master and among my thrilled friends and me he is known as "The Big O". ;!